Here’s the respected Mr Grimaldi. And here’s the same chap as most people saw him. I wrote about him before (seven years ago) because he’s a local resident in my neighbourhood – or rather was. But he’s still around. ‘Bryant & May: The Bleeding Heart’ opens with a young man and his girlfriend in a tiny London park, lying on gravestones. It’s easy to forget that these little green spaces were often created by churchyards, and only became public parks once the churches disappeared. Sometimes the churches remain but the yards are decommissioned for burials, and so one ends up with the very London sight of seeing office workers sitting on graves in the summer eating their lunches. The other day I returned to the memorial on Pentonville Road, at the gravesite of Joseph Grimaldi (18 December 1778 – 31 May 1837). He’s commemorated in the park where he is buried, which is also a general graveyard, a basketball court and a local public park. I wanted to see if the park still hid a little-known feature. In one corner it contains a memorial to the clown; a pair of coffin-shaped graves that ring out in different tones when you dance on them. A perfect memorial for a man who would have loved the idea of you dancing on his grave. 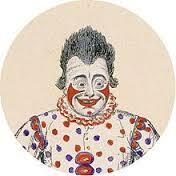 Grimaldi was the greatest English clown, ‘the first whiteface clown’. His performances made the Clown character the central figure in British harlequinades. He was born in Clare Market, London, the son of an Italian, Signor Joseph ‘Iron Legs’ Grimaldi, ballet-master at the Drury Lane and Rebecca Brooker, a dancer in the theatre’s corps de ballet. 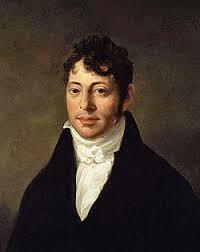 Grimaldi’s father died when he was nine, and plunged the family into debt. His son was on the stage at Drury Lane before his second birthday. At the age of three, Joseph began to appear at the Sadler’s Wells theatre. 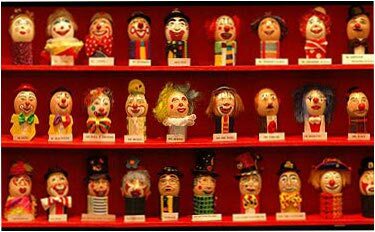 Clowns register their unique makeup by painting them on the shells of hard-boiled eggs; I have a book of the egg design register at home. 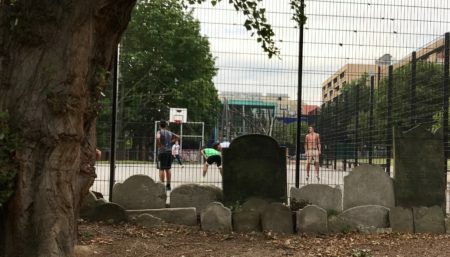 The basketball players don’t notice that stacked all around them are the headstones of others who were buried here. While Mexico celebrates its dead on November the 1st we tend to incorporate them into places of public recreation. That’s lovely Chris. The “dancing graves” memorial is fantastic. I never knew Grimaldi was born in Clare Market. “But where shall I find what you require?” said the patient. I like cemeteries and churchyards, and enjoy reading (or trying to read) the names and dates on the gravestones, trying to imagine what those long-deceased people were like. Please feel free to think I’m weird. Years ago I parked in a little village in Kent, spent the morning walking a bit of the North Downs Way, then sat in the local churchyard eating my lunch. After a while I overheard two obviously outraged little old ladies muttering about people eating in churchyards. I was completely oblivious to the fact that some people might think it inappropriate. Obviously I just ignored them and carried on with my lunch. James Gillray is buried in St James’ Church, Piccadilly. He’s got one of those flat slab style graves, the inscription badly worn after two centuries worth of feet. One of these days I’ll be in Waterstones or Stanfords and find somebody has written a book on Famous London Graves or whatever. In early Victorian times the dead to grave ratio in London was rather high so graves were recycled, often rather too quickly to be entirely sanitary. The number of people who still have an actual grave is therefore very low, mostly only the wealthy or eminent. 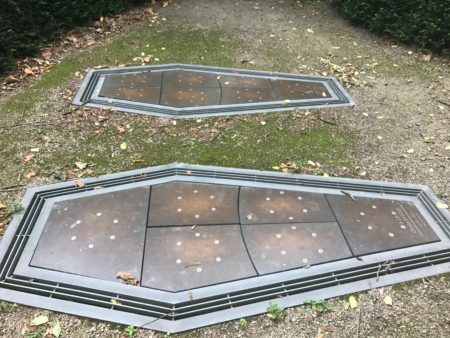 Presumably the panels on those graves are different notes. If you had a large mallet you could play them like a giant Xylophone! Forgot to mention that Necropolis, London and its Dead by Catharine Arnold is worth reading. Not about famous graves, more the problems of disposing of the hoi polloi after they’d kicked the bucket. 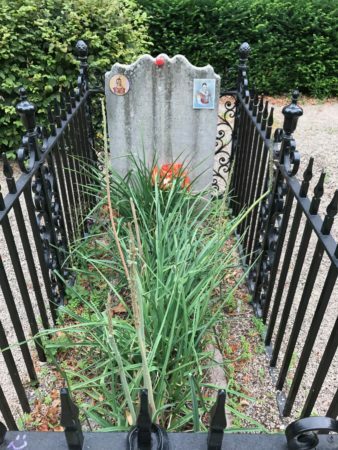 @Chris Webb– you were probably sitting on the grave of one of the old lady’s dear departed spouse! Really. Have you read Clarke’s book on the Necropolis Railway? Or Andrew Martin’s story about same…to your point about the death to grave ratio. I was sitting on a bench, not on anybody’s late lamented! Maybe it’s acceptable to sit and contemplate the hereafter, but not to contemplate a cheese sandwich. I have read all of Andrew Martin’s Jim Stringer books, the early ones are very good but I feel he lost direction during and after WW1. Haven’t read Clarke’s book but I’ll look out for it. There is nothing so restful or pleasant or as beneficial to the spirit as a brief sojourn in an old graveyard or picturesquely derelict cemetery. Notice I say “brief”. One appreciates the opportunity to walk out of such charming venues. In the meanwhile, there’s time enough before we must proffer our future corpses to the mould. Those little old ladies should appreciate someone who finds the local cemetery restful. Around here we’re having trouble with vandals damaging the stones. In New Westminster vandals who are captured are set to public service doing restoration and maintenance in the cemetery. I’m told there have been a number of personal transformations when the guilty learn some of the stories about the buried citizens. After doing some research (admittedly, Wikipedia; who doesn’t love Wikipedia? ), I found out how harrowing J.S. Grimaldi’s death was for his parents; both attempted and failed suicide. Truly sad. Depression can live through generations. I was intrigued by this story and it provides an example of the late Terry Pratchett’s knowledge of cultural history, if you recall his portrayal of the “Clown Museum” in “Men at Arms.” Thanks for this report.